Ancient Hawaii. Time before the arrival of a man from another civilization. Any bit of research would show you that Hawaiian culture in those times was highly developed. In fact, they had the same intimate relationship to the ocean, as they did to the land. The climate in Hawaii was ideal. The growth of food abundant. Fresh drinking water overflowing. There was no highly dangerous animals in the forests. Hawaiians celebrated life by expressing gratitude through social communication and openness, dance, song and by focusing on playing. On account of the surroundings, social culture, naturally aligned technology and isolation from the rest of the world, they had the perfect combination for the true meaning of leisure time. And above all, they were able to develop wisdom of life. The beach, the ocean and its waves were a place where they could extend their inact wisdom of how to live on land. It was in their nature to be humble, observant, patient, adaptable, persistent, athletic, spontaneous, intuitive and expressive. Surfing was an experiment that was bound to be successful, because of how, and what, they lived. That’s why they all surfed, regardless of socially conditioned roles. And that’s why they saw surfing as an extended celebration of life lived on land. It was more about the ocean, life, water, than about waves and performance. Riding waves was seen more as an achievement and a reward at the same time. Modern times. When nature, with its forces, is collectively seen as an opponent that needs to be identified, managed and eventually turned into a servant of mankind. Being quiet and observant seems in contrast with today’s active enrollment – just do it. Let’s erase all collective memory of surfing and throw a typical modern individual into the ocean. How much time would it take for her or him to understand that waves can be ridden, if at all? Surfing is becoming a mainstream sport across the world, yet its culture is lacking in content when it comes to understanding the depth of its transformational powers on the individual, hence society. The reason for this is that when surfing grew in popularity, and it is only starting to exponentially spread around the world (even moving into landlocked countries), it was already void of the cultural traditions of ancient Hawaiian people. There is roughly between 30 to 35 million surfers worldwide at the moment. That is more than the population of Australia. Let’s use our imagination and put all the surfers in the world into one country. Let’s use Australia, since it has year round surf. We assume they will mostly be accustomed to the modern global civilization and its technological, information based, capital culture. Do you think the vibe on the beach and in the water would even remotely resemble the temple-like ambient of reverence in ancient Hawaiian times? Go and to any beach today, observe and see for yourself. I have talked to countless surfers around the world about surfing’s lost cultural heritage, and even though they could not pick out what exactly that would mean, they all resonated with the idea that there is something missing in the lineups worldwide. You see, when we try to incorporate attitudes of the modern civilization into surfing, that is on account of its origin so different, it losses its true affect and appeal. If we assume waves are a finite resource, paddle battles occur and out the window goes a peaceful session. If we assume that there is not enough space for us to express our fluid personality in the waves, other people appear as rivals and aloha becomes only a word. If we deem the wave ride to be the only goal of visiting the ocean, then the joy of living gravity behind by immersing in a liquid medium can not happen. If we deem conditions to be good or bad, a session is bound to become another box with a sticker label. Surfing has the potential to become one of the social wheels of change towards respecting natural habitat, sharing resources and reestablishing existing systems from capital based to human oriented. The reason for that is surfing’s very essence of origin – people who understood life. And each and every time that we go surfing, regardless of what craft, if any, we use, we tap into that wisdom. The last ten years have seen me periodically visit lineups across Europe, Hawaii, Australia, along with long stays in Mexico and Indonesia. It became apparent to me that our global society started running away from issues on land, only to realize they cannot be solved in the ocean by acting the same way. The irony is that on a deeper level of personality we all surf, because it soothes the sores of life on land. Sure, you can overpower others by paddling, you can say waves are bad, you can treat others without respect or do anything else that emotionally rebalances you, but that way surfing will not really touch you. You can surf that way for decades and you will stay trapped in the same pattern of behavior. Or, one can calm down before going into the ocean. Take a minute to let go of any worries and issues on land. Ponder for a second about what is it that blocks me most in my personal journey. Is it impatience? Is it the lack to observe and identify opportunities? Is it the lack of confidence in my abilities? Is it the lack of courage to let go and trust the process of life? Is it weak willpower to endure wipe-outs, momentary currents or changing conditions? Is it stuborness and resentment to adapt my behavior to the circumstances? All of this, and everything else, can be practised and experienced in the ocean, while the ride itself becomes effortlessly attained reward. And imagine a lineup, where every single person understands this, thus encourages everyone else towards personal excellency. Since every surfer understands that until the sun shines and the ocean mirrors, wind will produce waves. We are living in times of global crisis. The crisis is uniquely ours – humankind’s, that kind of lost its kindness to humans, let alone to other species and natural elements. The surfing community faces a challenge to resurrect the ancient wisdom of the very same people, who unconditionally shared with us the science of riding waves. The majority of surfers are traveling nomads. This way we have, as a collective tribe of the entire 30 to 35 million, an advantage to spread across the world the message about how everything in life happens in waves. 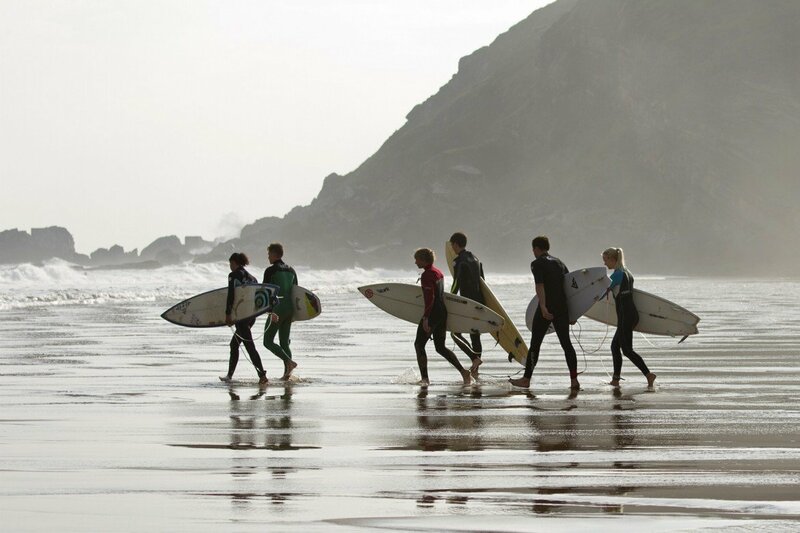 Surfing goes beyond being an art, a lifestyle, a sport or a profession. In its essence, it holds the teachings of how to live.